Please join us in Victoria for an information night discussing the 2018 study tours being presented by Kesho Trust. Click here to get the details of the time and location of the event. The 10th anniversary even of our Nature Child Reunion initiative was held recently in Victoria, BC. Richard Louv who participated in our initial events back in 2007 and 2009 was the keynote speaker and Lieutenant Governor of BC, The Honourable Judith Guichon, also participated. For a full report on the event, please see the link below. 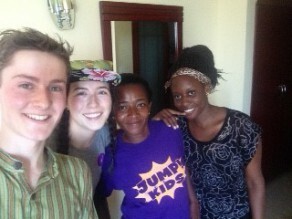 Our two Coop students from the University of Victoria, Alex Papp [left] and Justine Cowitz [left centre], have now arrived in Dar es Salaam and met up with our volunteers Penina Mairo [right centre] and Vaileth Mashauri [right]. There are logistics to work out but they all look happy regardless! We wish them well in the upcoming adventure. Our community story for the Saadani area has now been posted on the CCRN website. Similar stories highlighting the work of researchers and local organizations in the various study areas of the network from around the world are posted there.